Home of the Sleeping Bear Dunes National Lakeshore, Glen Arbor is located in Leelanau County, less than 15 minutes north of Empire, and less than a half hour south of Leland. Glen Arbor is a beautiful small town nestled between Sleeping Bear Bay and Glen Lake. There are many fun things to do in Glen Arbor including outdoor recreation, shopping and the arts, with great places to stay and eat. Glen Arbor is surrounded by visually dramatic lands, sculpted by the great forces of the the glaciers that covered Michigan during the ice age, and continue to be sculpted by nature today. Sleeping Bear Heritage Trail: This 22 mile multi-use trail starts in Empire and goes up the coast through Glen Arbor. Most of it is paved and is great for pedestrians, bicyclists and, in the winter, cross-country skiing. Sleeping Bear Point Maritime Museum: This family friendly museum has exhibits on the U.S. Coast Guard, the U.S. Life-Saving Service and the Great Lakes shipping history. Glen Haven Village: Just west of Glen Arbor, Glen Haven has several stopworthy sites including the Cannery Boathouse, a Blacksmith Shop and the 1920’s style general store. In the midst of protected shoreline and forest, Glen Arbor holds many beautiful small shops and galleries, restaurants and unique places to stay. The shopping experience may be more limited than a large city, however it's much more unique and personal. Make sure you check out the Cherry Republic and M-22 store. From gourmet food to handmade soaps, a full service bike shop to men's and women's apparel shops, Glen Arbor has something for everyone! Have a beach side picnic or experience fine dining with a view of the Sleeping Bear Bay. In Glen Arbor, there are endless opportunities for fun outdoor activities, no matter what season it is. 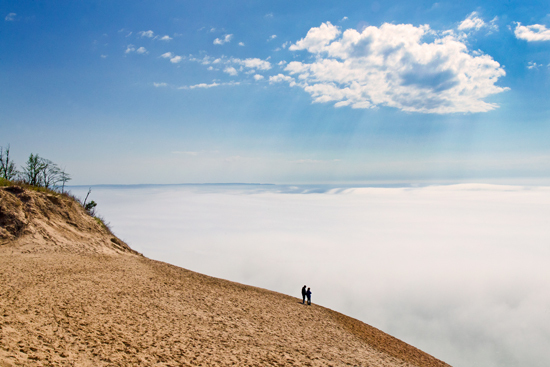 Less than ten minutes from downtown Glen Arbor, the Sleeping Bear Dunes are a must-see for new and returning visitors. The dunes offer sightseeing, recreational and educational opportunities in all seasons of the year. Glen Arbor is surrounded by thousands of acres of beautiful natural areas, just waiting to be explored. There is access to Sleeping Bear Bay, as well as the big and little Glen Lakes, and many other smaller lakes and rivers. With all the water access, there are plenty of opportunities to rent a boat or kayak and get on the river! Glen Arbor is also the perfect destination to enjoy pristine beaches. Bring the family and enjoy a wonderful day in the sun playing in the sand and water. Please read our story for more information on the history, trails and Manitou Islands of the Sleeping Bear Dunes. Annually in mid-June, the M-22 Challenge is quite the experience. Surrounded by such beautiful land, the Challenge is one of the most gorgeous and intense races around. The M-22 Challenge is a three part race; it starts as a 2.5 mile run at the west side of little Glen Lake. The second part is a 17 mile bike ride around little and big Glen Lakes and through downtown Glen Arbor. 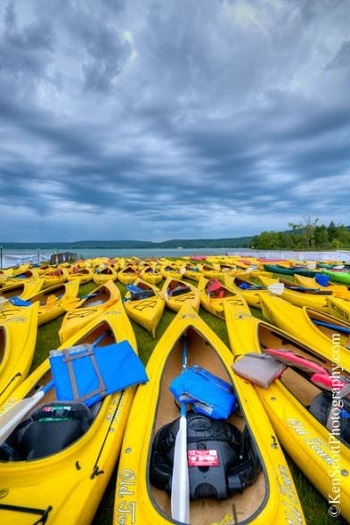 The third part is a 2.5 mile paddle on Glen Lake. For more details, read our M22 Challenge story, and make plans to stay and sign up for the next race.